For determining the DBMS of the year, we subtracted the popularity scores of January 2014 from the latest scores of January 2015. We use the difference of these numbers, rather than a percentage, because that would favor systems with a tiny popularity at the beginning of the year. The result is a list of DBMSs sorted by how much they managed to increase their popularity in 2014, or in other words, how many additional people started to communicate about it in one of the ways we measure in our methodology, for example job offers, professional profile entries and citations on the web. MongoDB gained one rank and 72.7 scoring points in 2014, which makes it a clear winner in that race, just like last year. MongoDB has been the most popular NoSQL system since we started our ranking more than two years ago. It has gained an impressive degree of reputation and popularity, so that many people start here when looking for alternative, non-relational systems. MongoDB has managed to create the feature set, stability and infrastructure ecosystem, that satisfies the requirements of many use cases, so that often people see no need to look any further once they have acquainted themselves with MongoDB. There is no shortage of competition in the fast evolving area of database management systems, and many of the more than 200 systems in our ranking offer specialized features and high quality. The database world is expanding in many directions, but MongoDB seems to have taken a direction that many developers like to follow. Redis has established itself as a preferred solution for all forms of caching problems, but it can be much more than that. We often see, that once Redis is installed for caching, and people experience its speed and reliability, they start moving more and more functionality there. While it is still rare that a complex application is based entirely on Redis, the uncompromising design principles of Redis focusing on performance, simplicity and stability together with a feature set that is based more on user feedback than on any database theory, often make it an excellent basis for selected parts of complex systems. In many applications, collecting Big Data is useless unless you have the means for performing sophisticated searches through the pile. No surprise that Enterprise Search Engines, altough not the most typical type of DBMS, have significantly gained in popularity, and Elasticsearch more so than any other. Solr ist still the most popular search engine, but the gap to Elasticsearch is closing. Elasticsearch and Solr are both based on Apache Lucene, and in many ways they are quite similar, but Elasticsearch as the younger of the two systems seems to have the momentum on its side. We congratulate MongoDB, Redis and Elasticsearch for their extraordinary achievements in 2014. All three systems are open source, which confirms a trend we have seen and reported on before in our open source vs commercial systems evaluation. Another remarkable fact is, that the tree winners represent very different types of database technologies, which illustrates well the variety of exciting new developments in the DBMS area nowadays. We are looking forward to see what the new trends in 2015 will look like. 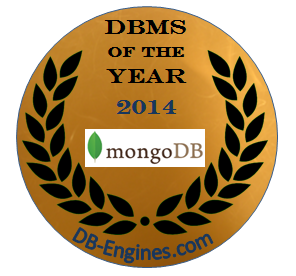 Dev Ittycheria, President & CEO of MongoDB: "We are honored to be recognized as the Database of the Year by DB-Engines. This acknowledgement is a clear testament to our large and fast growing community of users, customers and partners who have made us the most popular and leading database management system. Our community, coupled with our incredibly talented employees located around the world, clearly position MongoDB for accelerated growth and increasing market share." Salvatore Sanfilippo, Inventor of Redis: "I'm very happy to see Redis gaining popularity regardless the small development resources and zero "intentional" marketing. It means that small systems have definitely a large appeal and that engineers are able to share their knowledge in an effective way. However I'm pretty sure Redis has yet not reached its full potential because it was lacking in certain ways. We are going to release Redis 3.0.0 stable in the next days, and new features to improve memory usage, high availability and access control are currently actively developed for the next releases. With a more convincing, out of the box scalability and fault tolerance support in 3.0, and the new features planned in the 2015 roadmap, I hope to see Redis serving better the need of developers and operations people, and as a result, a raise in adoption, a larger community, and the project entering a more mature stage." Shay Banon, Creator, Founder and CTO of Elasticsearch: "We had another groundbreaking year at Elasticsearch. We released several major versions of our software, focusing on improving search, real-time analytics, and resiliency for both Elasticsearch and Apache Lucene, which Elasticsearch uses. This achievement speaks to the quality of the product, it’s explosive adoption rate, and the continued support and dedication from the Elasticsearch community. We believe that search is instrumental for many different use cases, and seen this proven across many thousands of deployments — from content search, to operational logging, metrics aggregation and analysis, fraud detection, and beyond. In 2015, we expect to continue pushing the boundaries of what we can do, and help our ever-increasing user base be successful."